In conjunction with the recent U.S. Department of Treasury announcement that Harriet Tubman will be the new face on the $20 bill, the Tubman Museum has launched a fundraising campaign to purchase a sculpture of Harriet Tubman. The goal is to raise the $9,000 required to purchase the work by artist Fred Ajanogha for the museum’s permanent collection. Currently on display in the Tubman’s John S. and James L. Knight Gallery of African American Art and History, the sculpture is an incredible life-sized execution of the famous H.B. Lindsley photograph, “Portrait of Harriet Tubman,” taken in 1880. Created in 2013, the piece was originally shown in the Tubman Museum’s Collection Gallery in an exhibition entitled “Afrofuturism Rising: Black Art Across the Spectrum,” in partnership with the National Alliance of Artists from Historically Black Colleges & Universities and Fort Valley State University, from October to December 2015. Of the three Fred Ajanogha sculptures on display at the Tubman Museum in 2015, this is the work with which most people wanted to be photographed. Atlanta-based sculptor, Fred Ajanogha, attended the Creative Art Academy in Nigeria, where he studied under the direction of Doran Door. He also spent time in the studios of many other well-known contemporary Nigerian artists, including Ben Osawe and the late Felix Idubor. Ajanogha credits these Benin City artists with inspiring him and paving the way for him to pursue sculpture as a career. Ajanogha’s work is currently on display at such institutions as Hartsfield-Jackson International Airport, Apex Museum, Clark Atlanta University and Southern University Museum of Art. Other works are in the private collection of former President Jimmy and Mrs. Rosalynn Carter and the home of poet Maya Angelou. 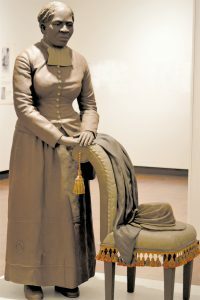 This fundraising effort will help the Tubman Museum keep this important Ajanogha sculpture in Macon. All donations, which are tax deductible, can be made at the Museum Store, by check to the address below or online here. Please provide your contact information (name and address) for the tax deductible receipt of donation letter, which will be mailed to you.